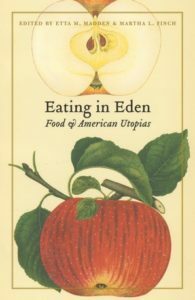 Vegetarianism is not a recent American trend, influenced by immigrant cultures and travel abroad. Waves of interest in meatless diets have surged and ebbed through the centuries. In fact, even 18th-century American “founding father” Benjamin Franklin abstained from meat as a young adult. According to his Autobiography, Franklin was motivated by desires for professional productivity and frugality rather than moral or spiritual beliefs. In the 19th century, some American Transcendentalists, such as Bronson Alcott, and the “man of science” Henry David Thoreau, advocated vegetarianism for spiritual reasons. My essay in the Cultural Encyclopedia of Vegetarianism discusses these 19th-century advocates of doing without animal flesh.